Dev Blog October — High Five Studios, Inc. In a slight break from our normal structure, we’re going to spend a few blog posts going in depth on a few topics to provide a bit more information about the way the studio make decisions and how we operate day-to-day. We’ve taken a few polls to find out what you guys are interested in, and in this round we’re going to focus on the design and development path of the prisoner cabins. If you have suggestions for future blogs, we encourage you to reach out to us twitter, discord, or steam. 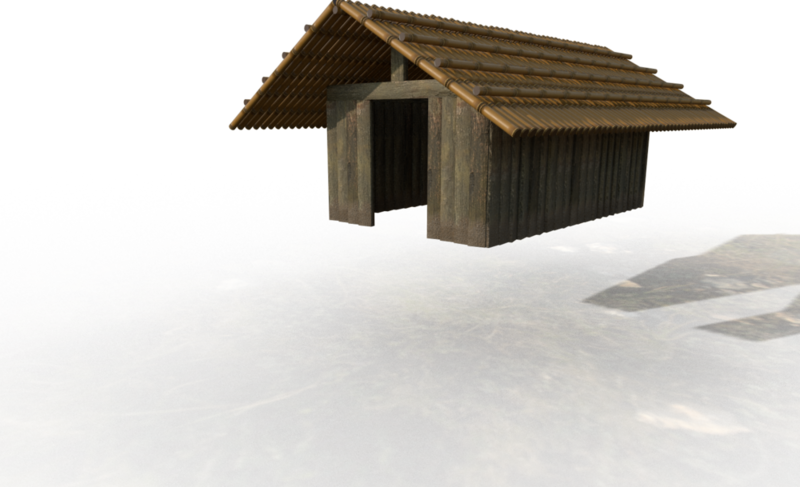 The prisoner cabins were important for us to get right because they’re one of the areas the players spend the most time around. Our goal was to make a group of relatively similar and simple buildings still interesting, both visually and in gameplay. The cabins are also the closest thing to a home base players can connect with, which helps players create an emotional connection with the camp. First, we wanted to use the buildings to reflect the story of the camp and to help players understand their place in our narrative. Second, we wanted to create a space that was consistently navigable and without frustration so players could feel comfortable in their temporary home. Third, we wanted to make sure that the encounters that the player has with others within the cabins feel significant in their own way. Jumping into how the cabins reflected the place of prisoners within the camp, there were some traits we felt the buildings needed to have. They needed to feel weathered and constructed with deliberate apathy, since guards would have built these cabins some time ago. For this, we needed to walk the line between a shack that was left in shambles and an old building that has stood for a long time. This was accomplished by giving the buildings slightly rotten wooden walls that were made up of distinct, thick boards and irregular construction so that not all the buildings have the same dimensions or layout. We also decided that doors should be more of a deliberate hole in the wall instead of actual doors (think of your very first Minecraft house) since it really adds to that “I’m in a hut” feeling. The last thing we did was to make the roof out of lashed together bamboo. Not only did this add some geographical context to the camp, but the sky coming through the buildings bound the light very closely with the time of day. The day/night cycle is a very important part of the atmosphere throughout the game: days are regulated by a strict schedule and good visibility, while night is a more chaotic time of foraging, sneaking, and monsters. Binding the visibility in the cabins to natural light means that, during the day, being inside a cabin will have good visibility and a lot of vitamin D, but at night, it will be further restricting already-low visibility and leaving the player cornered by monsters and guards alike. The next topic on our list was to create a space that felt navigable and convenient. To do this we focused mostly on the typical paths that a player would be taking (from their bed to the parade ground, for instance) and tried to make this as non-frustrating as possible. This meant keeping the path relatively straight, being able to see the goal very early on in the path, and having a few landmarks visible at any time in order to keep oriented. While this process may seem simple and boring, we determined what these paths look like meticulously because we want the players’ home to have a distinct feeling at all times, and being explicit with this allows us to use the landmarks in other places throughout the game. Later in the game, when the player begins to explore the level around them, finding similar landmarks in the world will evoke similar reactions and those reactions can be used to help or scare the player. The last thing that we wanted to do was to have meaningful encounters within the cabin area. For this, we drew from the same sources as the previous step: where players would be spending most of their time and where they would be going. We could not do what we do normally do when we design buildings (provide two or three ways to approach a goal, each with different requirements) since that would be a chore to navigate in the prisoner cabins. We had to leave most of the paths unobstructed in order to not be frustrating, so we designed the cabins around a very different type of interaction: monster encounters. The way our monsters are designed, encounters are heavily dependant on straight lines between the player and the monster due to line of sight and simple movement abilities (dashes and leaps). What we looked to create were lines of long visibility that presented themselves very quickly during gameplay. These are often referred to a sniper corridors in other games like CS:GO and Overwatch, and they are made using harsh corners at varying angles. We also wanted to focus on placing these corridors in places the player would often go, to force the player to commit to their movement choices. To accomplish this, we built the cabins in an irregular oval pattern, skewed toward the north-east corner of the camp. We varied the width of the buildings to enhance the irregularity and the circular pattern, causing these line of sight corridors to focus near the center of the buildings. The north-east skew took the focus slightly away from the direct center and moved it toward the player’s cabin and the hole in the fence, both very common destinations. The player cabins are one of the most distinct parts of the map, so we really had to get them right. It was a very meticulous process, but the end result was a level that we hope you’ll agree is interesting, pretty, and well constructed. Next week we’ll be going on a dive into the monster design of Two Mouth. We’ll be talking about his art and design heavily and giving some clues about what to expect from your interactions with him in-game. As always, if you have any questions or comments, don’t hesitate to reach out to us on social media. Our twitter, discord, facebook, and instagram are all on our website at www.high5studios.com. A top-down view of the cabins laid out. We turned off most of the objects that are included in the cabins to see them clearly. In this, you can see the sight lines and and empty spaces that we tried to enforce within this portion of the map.